Mother Nature just stomped on my heart today. Last week our temperatures were in the mid 50's and 60's and today it was 26 degrees and there is 2 inches of snow on the ground! I am so bummed! I really thought we might be done with winter - wishful, I guess. Anyway, we spent most of the day inside (with the exception of a trip to Costco, obviously) and in our comfies. 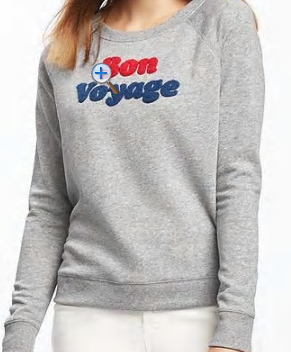 This sweatshirt is one of my favorites and I own in it a couple color/design variations. I sized up to a medium for a roomier fit and to account for shrinkage in the wash. Anyway, I liked a few of my favorite sweatshirts, including the one I'm wearing. I hope you spend a lazy weekend in your comfies!